Dogs are are the best, especially when they take on the role of cheerleader! Remember the adorable dog who sat in the rain last year to cheer on runners in the Boston Marathon? He’s back along the course again, and he’s got a new raincoat! 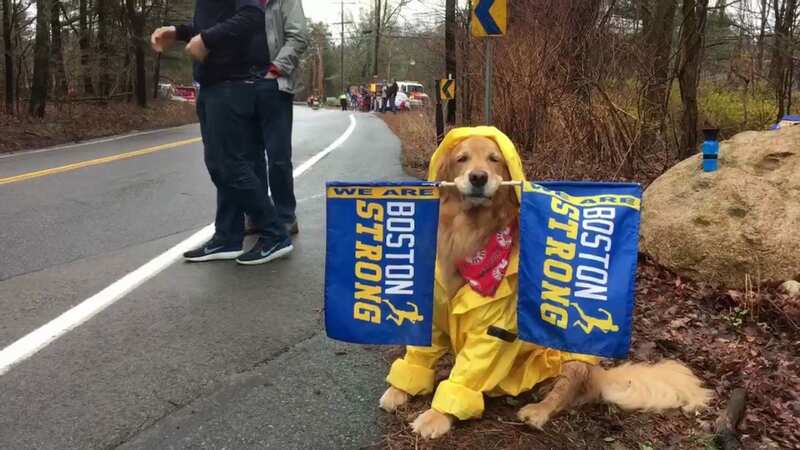 A local celebrity named Spencer is back on the Boston Marathon trail this year, doing what he does best – being adorable. 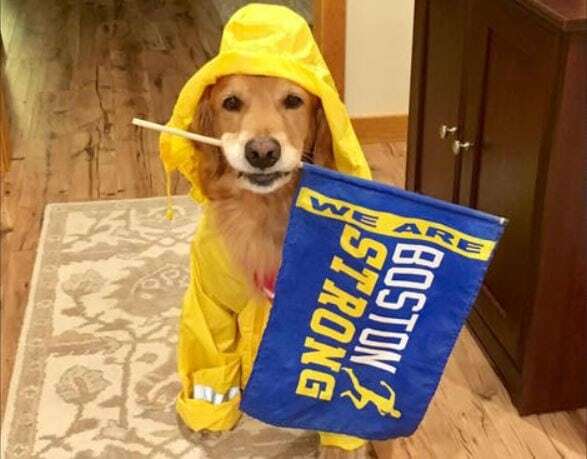 Spencer is a therapy dog who attends Boston’s famous race every year, sitting on the sidelines with his owner, Rich Powers. Spencer is there for one reason: to encourage runners and give them something cute to look at during the grueling race. This year, Powers and Spencer are posted up between mile 2.5 and mile 4 of the race, the dog owner wrote on Facebook. Spencer, a golden retriever, is donning a bright yellow raincoat during the soggy race. He is also holding two “Boston Strong” flags in his mouth. Spencer’s sister, Penny, often joins him on the sidelines, but she doesn’t enjoy the rain. So it seems this year, like the last, Spencer is cheering on runners alone. In 2018, Powers’ video of the pup in his raincoat received more than 2 million views. “We were there to motivate. And judging by the faces we saw running, it was a success,” Powers told Inside Edition after last year’s race. Spencer has been attending the marathon for three years and his popularity has grown with each race. Runners commented on Powers’ Facebook posts ahead of this year’s marathon, many saying they couldn’t wait to spot Spencer on the sidelines. 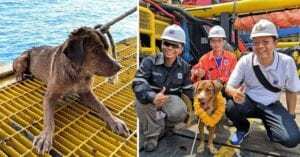 “I will be running it on Monday and I will try to find you to get a picture with your dogs. Thanks for cheering us runners on!” one woman wrote. “Best cheerleaders ever!” another commented. 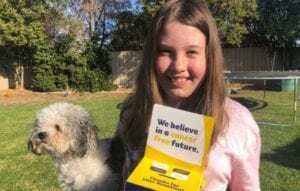 Therapy dogs Spencer and Penny also visit local schools and hospitals to provide support, according to Powers’ Facebook. Good News Of Your Own? Copyright © 2019 Majically, Inc. All Rights Reserved.